We all know the importance of having IMEI number of Samsung Galaxy S4 and Note 3 which can be easily found by these 3 tricks in the Galaxy S4 and Note 3. 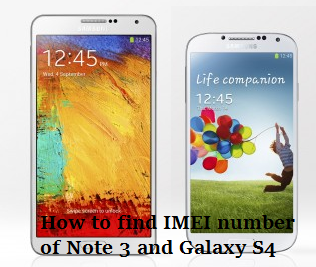 These 3 techniques are going to help you easily acquire the IMEI number of your Samsung Galaxy S4 and Note 3. It is important to have the IMEI number because in certain situations like when you loose your phone the imei number is required to track your device. If punching in the *#06# doesn’t work, does that mean the phone is already unlocked? Which phone are you using? The IMEI number does not have anything to do with the device being locked or unlocked. So it should show the IMEI number whether it is unlocked or locked. I have a Verizon Note 3. But when i dial the code, it does not display the imei number. what should i do?